Bookshelf, chair, decorative loud furniture, inevitable cat bed - all in one! 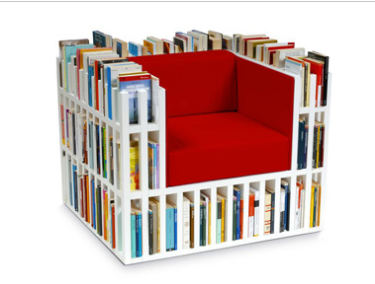 The cool thing is that since everyone's library is different, no two chairs would be the same. My version might only be half full now that I've given away most of my library to GoodWill (I've found moving will do that to your library). I wonder how heavy it is without all the books, maybe it would even be an easy piece to move, killing yet another bird with one stone!